Featured here from the Bryant collection is this 4 piece micro fiber saddle furniture set. Made of kiln dried wood frames, and interwoven webbed bases. This sofa, loveseat, chair and ottoman are 8 way hand tied. 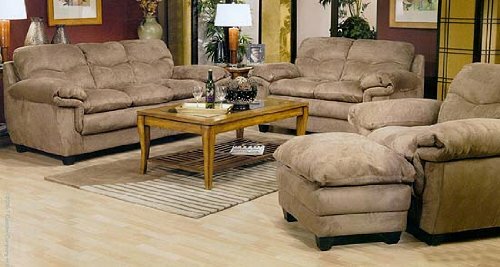 Furniture is covered in a padded micro fiber material in a saddle finish. Furniture has pillow top seating for extra comfort. Legs are bold dark brown tapered stubs.